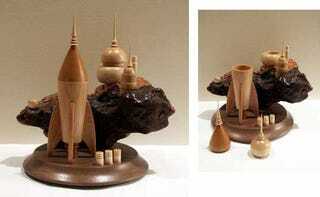 If you look at the space-age scene on the left, you see the amazing carving technique of Johnna Y. Klukas, a former computer scientist who transforms wood burls into otherworldly scenes. But if you look at the image on the right, you see the true genius of Klukas' work, which is that many of her elaborate sculptures contain secret compartments. Pop the nose cones off these rockets, and you get a space-age wooden stash box or a good spot to hide your encrypted USB drives. This sculpture is called "Outpost," and we've got more of Klukas' artful, intricate wooden designs below. Here's another rocket hideyhole setup, called "Oasis." One of the most amazing sculptures she's created is called "Wood Wife's House," and it looks to me like a vast surface-and-subterranean complex full of generators, secret stairs, and zillions of little cubbies and drawers where you can hide your tiny valuables. Then we have two angles on a Klukas sculpture that harbors no secrets. I love "Long Haul," below, a generation ship that's still partially just a wood burl. It looks like an asteroid that's been hollowed out and repurposed as a long-term space vessel for traveling between stars (or galaxies!). "Supply Ship," below, is pure space-age coolness, with the wood grain used to represent the rocky surface of an alien world where our rocket has landed to offload supplies to the local colonists. You can see a lot more of Klukas' gorgeous sculptures in her online gallery.